Jungle is something that's been on my 'to-do' list for ages. 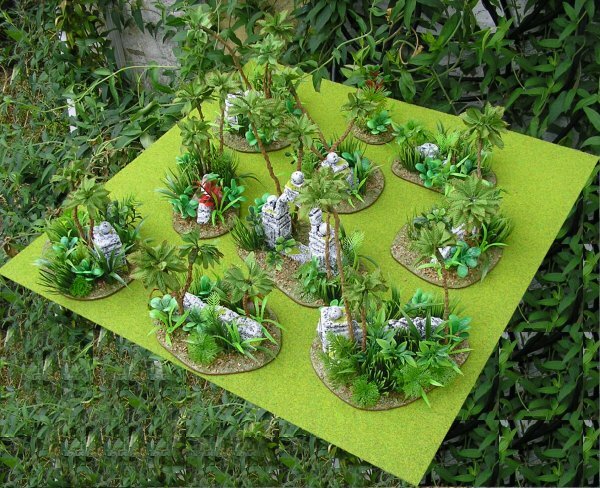 I had planned to make my own African jungle canopy scenery this summer but time and building Entebbe overtook me so I made these Malaysian jungle bases with palm trees and ruins instead because the stuff for these has been lying around for a couple of years or more and they were long overdue. Nothing here is my own work, all the components were bought off-the-shelf and are, for the most part, readily available. The bases are hardboard and MDF cut and sanded into shape. 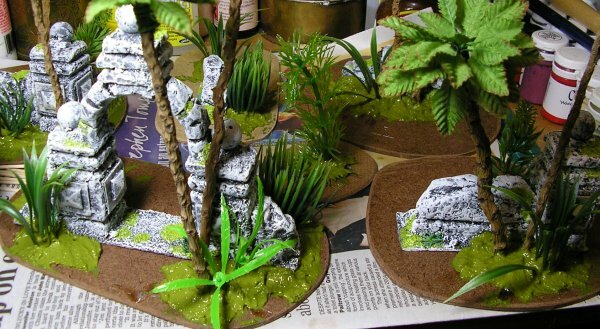 On to these I glued my ruins which are made from polystyrene. 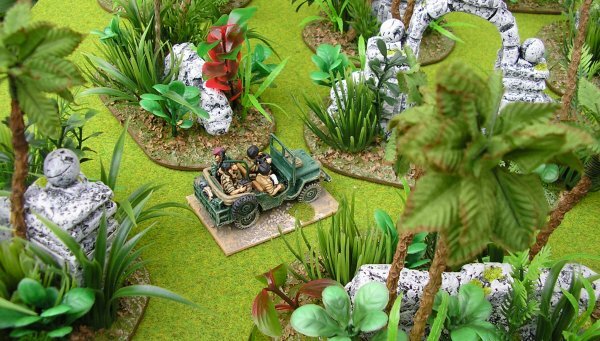 I bought these from a Polish chap on e-Bay for about £10.00 for the set of nine but there are many alternatives available either from terrain companies, aquarium shops or scratch-building your own. I was drawn to these by the colours, the almost white stone and light green flock made them look suitably aged and I could already picture them surrounded by verdant undergrowth. Next I added some palm trees to give some height to the bases. I got my palm trees from somewhere that has since disappeared but there are many palm trees available from eBay sellers for pennies. As with the ruins there are many different palm trees available. I liked these the best, they cost £2.00 each with a discount for bulk. I bought 30 altogether but couldn't find all of them in time for them to be included here, only 22 made it on to these bases. 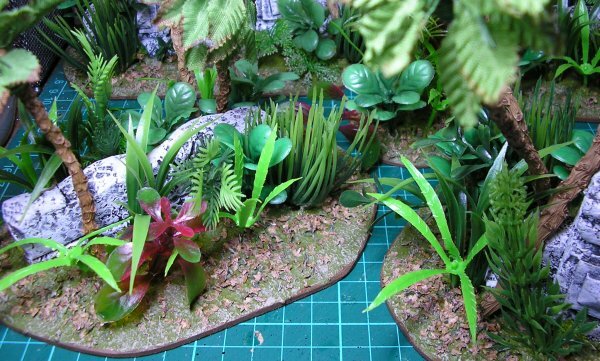 Along with the palm trees I used various plastic aquarium plants for other jungle foliage. Plastic aquarium plants are widely available and very cheap. Most of mine came from an American seller that was having a sale, even after international postage they were cheaper than my local pet shop. I bought about £20.00 worth which filled a large box, I used a tiny fraction of what I bought on these bases. The palm trees had drawing pins pushed into the bottom of their trunks to give them a larger surface area for gluing. I used a hot glue gun to fix everything, it's quick and secure. A hot glue gun is a pretty much indispensable tool in this hobby and there isn't much else that will adhere to the polythene that the plants are made from. If you don't have one rush out and buy one now! The palm trees were glued three to a base, usually in a group, with two bases having only two and the last base having none at all. Obviously, if I'd found the missing trees, each base would have had three since this looks best. 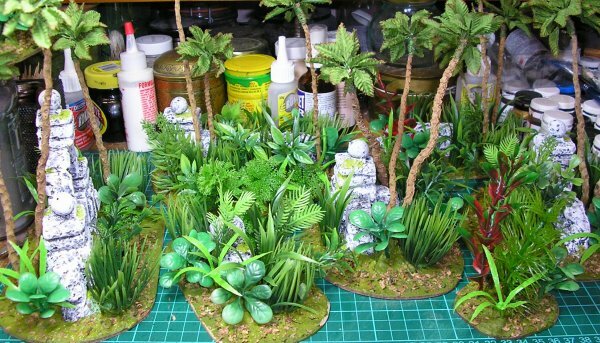 You can't cover the whole base with plants in one go because you'll never get between them afterwards to cover the exposed base so I glued plants around the central part and then covered the exposed glue and space between them with a generous application of green Basetex. There are alternatives to this, grout, filler, glue and sand/flock etc. Whatever you use I suggest you pre-colour it first as painting it later will be very difficult. I use Basetex because it acts as a strong glue as well as being a coloured, textured filler. Edit: These days I make my own basing compound from paint, PVA glue and fine sand. It costs very little per litre but the initial outlay for the ingredients can be pricey. 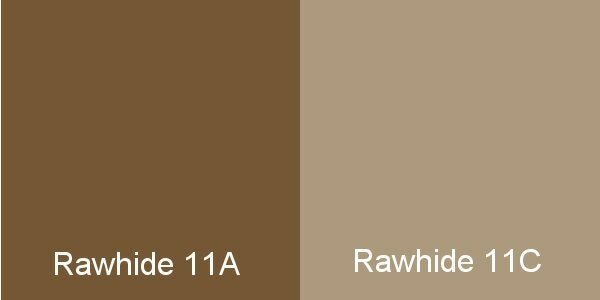 I get my paint colour matched at a local hardware store. 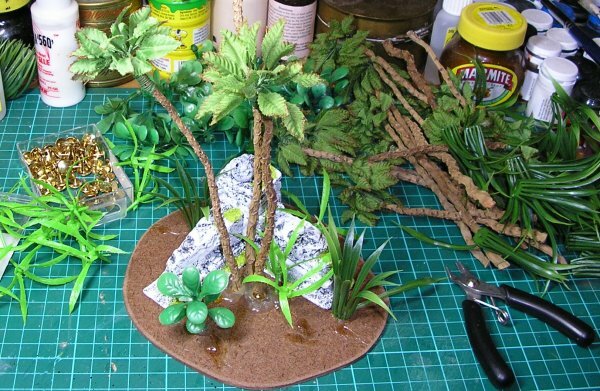 Once the first application of Basetex was dry I went around again with the glue gun and added more plants. This was followed by more Basetex then more plants and so on until I was happy with the density of the foliage. The final application of Basetex was followed by a sprinkling of leaf litter from Antenociti's Workshop. Once dry the Basetex holds the leaf litter in place without the need for further glue. Finally I dry brushed the exposed ground with Foundry 11C Rawhide and painted the base edges with Foundry 11A Rawhide to match them to my existing figure bases. Interestingly (or perhaps not) these aren't that cheap. Hardboard bases: Inconsequential, I got 2x 8ftx4ft boards for £5.00, these bases took up a tiny fraction of it, 3 square ft max including wastage from cutting. Ruins: £10.00 off e-Bay, could make your own but not much cheaper once you've found some polystyrene, bought compressed paper balls, square pin things, flock, paint, time etc. 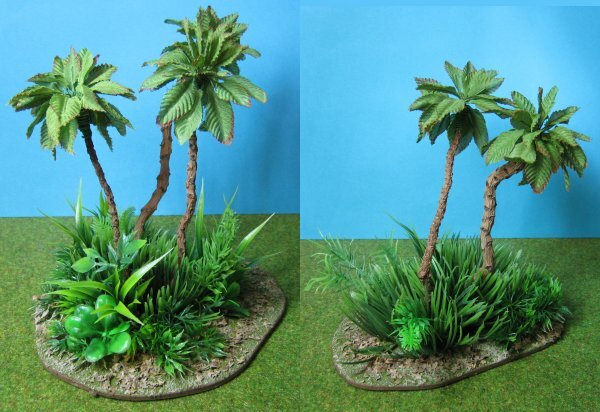 Palm Trees: £1.50 each, paid for 20, got 22, £30.00 total. Basetex: Didn't scrimp, used most of a half litre tub, probably £7.00 worth. Total cost: £49.50 divided by nine bases is £5.50 each. Not something to make and sell for a profit but reasonable I think. Cheaper than 3 decent commercial forest trees on a base even before the rest of it. Not the peanuts people would have you believe unless you go for just aquarium plants and a bit of grit which really would cost almost nothing. Wouldn't look as good though. 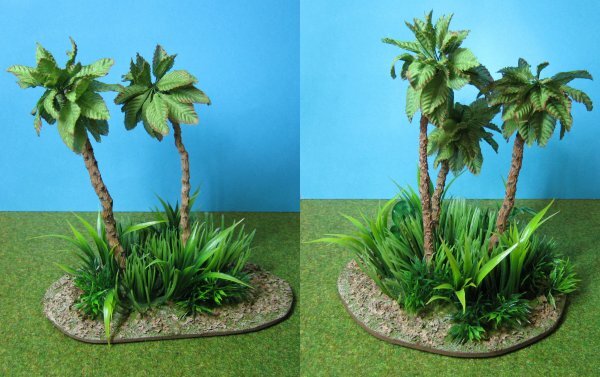 After a bit of digging around in various boxes I found my original ten palm trees so I made four more jungles bases with just them and some aquarium plants. These work out at about £3.00 a base.